I don’t know about you, but my least favorite bill is the heating bill. Don’t get me wrong, I love keeping a nice, warm home and making sure my family is comfortable, but there’s just something about heating costs that I don’t like. Maybe it’s because they remind me that I don’t live in Hawaii, or maybe I’m just a frugal gal who doesn’t like to spend a lot of money on things I can’t actually see. This is a big one. Contrary to popular belief, you don’t need to keep your home at a toasty 76 degrees during the winter months. Set your thermostat for somewhere between 66 and 68 degrees and throw on a hoodie if you’re a little chilly. At night and when no one is home, turn it down even lower – around 64 degrees at night and 60 degrees when you’re not home. You’ll save A LOT of money just by taking this one simple step. Okay, this is two tips in one, but I’m combining them because they’re easy. First, flip that little black switch on your ceiling fans to make them turn counter-clockwise. It’ll help circulate the warm air downward that lingers near the ceiling. Next, close off any heating vents in unused or rarely used rooms. Go ahead and do both of those things right now – it’ll only take about four minutes! Our home uses a furnace and our heating oil contract included a free annual tune-up. If you have the same option, take it! An inefficient heating system, like an out-of-tune car, will burn a lot more fuel than necessary. If you don’t have a free tune-up service, there are still things you can do on your own. Starting with the easiest thing: Changing your furnace filters. Do it at the beginning of winter and again in the middle. 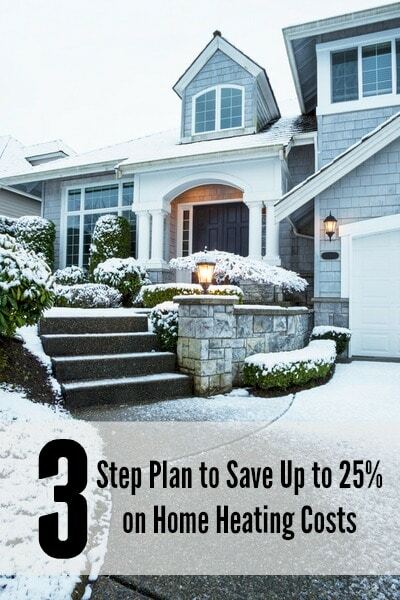 So there you have it, my three-step process for saving on your heating costs this winter. Like I said, it helped me cut my monthly bill by 25 percent. It may or may not have the same effect for you, but I guarantee it’ll save you at least some money, and that should make you feel all warm inside. How do you save on heating costs in the winter? I live in FL, so we don’t normally use the heat in our house. I remember one year we did and I felt like I was having a nosebleed!!!! The dry heat air kills me!! We always keep our heat off and do what you recommended (putting on a jacket, etc) if we get chilly..and when it gets cold-cold, my son has socks and those long pjs on!! Great tips! May I suggest you get rid of the oil and switch to natural gas. We switched to an energy saver system and it costs about $75.00 a month to warm a 2000 thousand sq. ft. home at 69 degrees during the day and 65 at night. If I get chilly I just get up and clean something. That warms me up in a hurry.